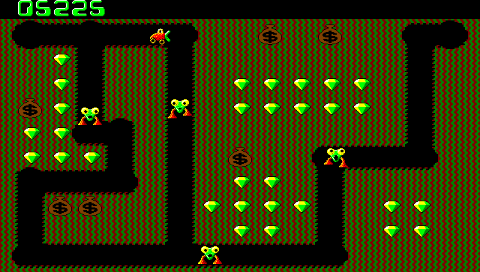 Project description: Digger was released on PC in 1982 by Windmill software. Andrew Jenner loved it so much that he created an open source version called Digger Remastered. This is a port of that version to the Sony PSP. The object of the game is to get as many points as possible by eating all the emeralds and bags of gold. The Hobbins and Nobbins don't seem to like you doing this and they will try to stop you. You can terminate them by squishing with the gold bags, eating them after you get the magical cherry powerup or shooting them with your slow to reload fireball. I will add sound in the next version. For now, you'll just have to hum the music to yourself. I will add sound in the next version. Hi. Great old game. Much time past, but will you plan to make it? I would like to add music/sound one day if no one else does but I don't plan to do it soon. There was an easy fix I did on the Wii version to stop the colours displaying wrong when you get the cherry, I could add that fix to the PSP one. Good to know someone is interested, maybe that will motivate me. Hope so. This game is so classic like Tetris, but not so popular unfortunately. Great game! I've very much enjoyed it! Every couple months I check just to see if it's been updated. I would love if there were sound and quite possibly a way to save the score. It should save the score already. If not that is easy to add.